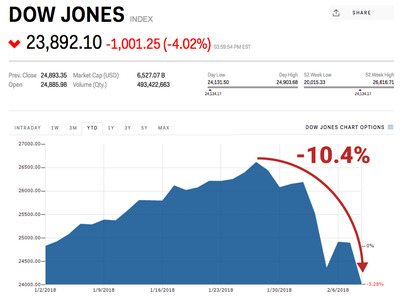 US stocks continued their wild week and are now in a correction. 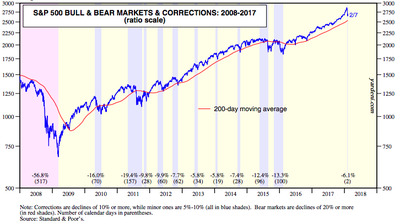 Corrections are usually defined as a 10% decline from a recent or all-time high, while a bear market is a more sustained and deeper drop of 20%. The benchmark S&P 500 closed at 2,581.08, about 10.2% below its closing high of 2,872.87 on January 26. Similarly, the Dow Jones industrial average closed at 23,860.46, down about 10.4% from its high of 26,616.71, also on January 26. The last time the S&P 500 entered a correction was early 2016, and that came on the heels of another selloff in August of 2015. 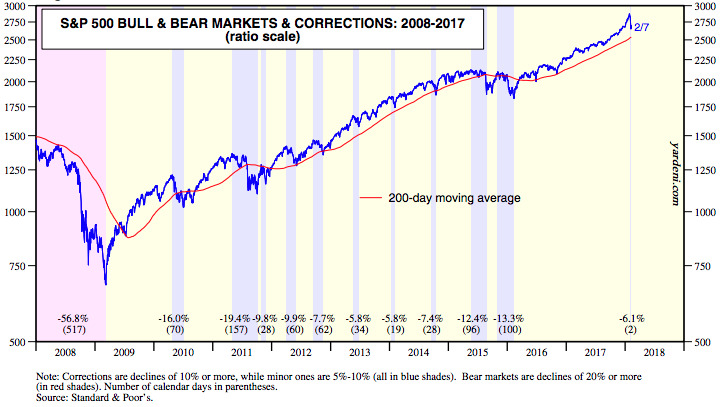 The chart below, from Yardeni Research, shows corrections and bear markets since 2009.